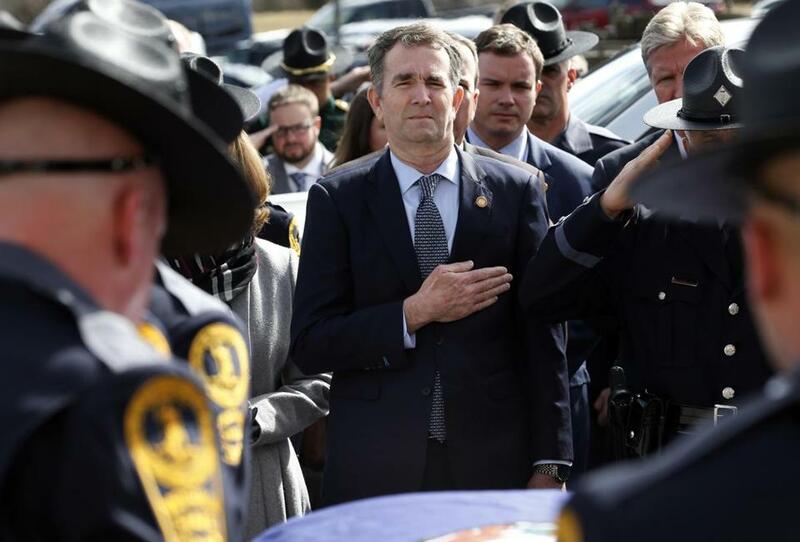 Governor Ralph Northam of Virginia attended the funeral of a state trooper on Saturday in Chilhowie, Va.
RICHMOND, Va. — After a week of revelations that have separately disgraced Virginia’s top three political leaders, Governor Ralph Northam remained firm Sunday in his intention to stay in office and stopped short of calling for the resignations of his fellow scandal-plagued Democratic leaders. Asked about his two besieged colleagues — Lieutenant Governor Justin Fairfax, who is facing accusations of sexual assault, and Attorney General Mark Herring, who admitted to wearing blackface as a college student in the 1980s — Northam said that they “have all grown” over the past week, and that the decisions on whether to resign would have to be made by the men themselves. The governor endorsed Fairfax’s proposal, made in a statement released Saturday night, to have the FBI investigate the sexual assault charges. “I really think where we are now, we need to get to the truth,” he said. The governor, who initially apologized for appearing in the photo and appeared to be on the verge of resigning, has since insisted it is not him in the picture. A Washington Post-Schar School poll released Saturday showed that Virginians are evenly split on the question of whether the governor should resign. That same poll showed that black residents were in fact significantly more likely to support his staying in office, though nearly 40 percent still believed he should step down. The scandals also could hurt the Democrats’ chances of flipping control of the General Assembly. All 140 legislative seats will be up for grabs in November and Democrats had previously been hopeful that voter antipathy toward President Trump would help them cement Virginia’s status as a blue state. Now many fret their current crisis in leadership will not only cost them chances of winning GOP-held seats, but also several seats currently held by Democrats. Still, he has lost the support of nearly all Virginia Democratic leaders and lawmakers, who have overwhelmingly said they back his resignation. One legislator, a Democrat, said he would introduce articles of impeachment if Fairfax did not step down by Monday. Despite Fairfax’s and Northam’s vows to remain in office, it is not clear how much support they can regain. Appearing on CBS’ “Face the Nation” after clips of the interview with Northam were played, two Democratic members of Virginia’s congressional delegation, Representatives Jennifer Wexton and Don Beyer, said they still believed Northam and Fairfax should step down. In the Washington Post poll, nearly two-thirds of respondents said they did not know enough to form an opinion about Fairfax’s denial of the initial sexual assault allegation by Vanessa Tyson. The poll was taken before the second allegation of sexual assault became public. Wexton and Beyer were not the only politicians to weigh in on the scandals in Virginia on Sunday morning. Shortly before their appearances, Trump chimed in on Twitter, apparently alluding to the political awkwardness of scandals that may take down the black lieutenant governor while leaving in place the white governor and attorney general, who have both admitted to wearing blackface.